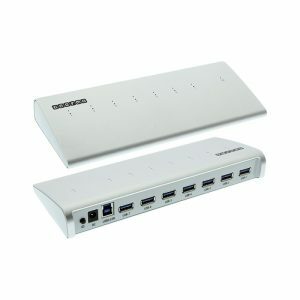 The new Gearmo 7 Port USB 3.0 hub is designed to be rugged and Mountable. Providing up to 600W surge protection over each port, it helps to protect your investment. All 7 data ports and connections are easily accessible making it easy to connect to your data. LED indicators show port connection confirmation and includes mounting brackets for surface mounting. The GM-HU37DW Gearmo USB 3.0 7 port hub is an industrial metal hub that is a total package! All ports, both downstream and upstream ports are conveniently located on the top facing panel along with the terminal and barrel power connections. The GM-HU37DW USB 3.0 hub includes mounting option hardware for both surface and DIN-Rail mounting. Compliant with USB 3.0 standards, data speeds up to 5Gbps can be achieved and is backward compatible with USB 2.0 and 1.1. The GM-HU37DW is part of the Gearmo Prosumer series of hubs and includes the power adapter to handle the power needed for industrial applications.